The Zlatibor Regional Development Agency is a knowledge-based organization and a catalyst for the socio-economic development of Zlatibor Region. 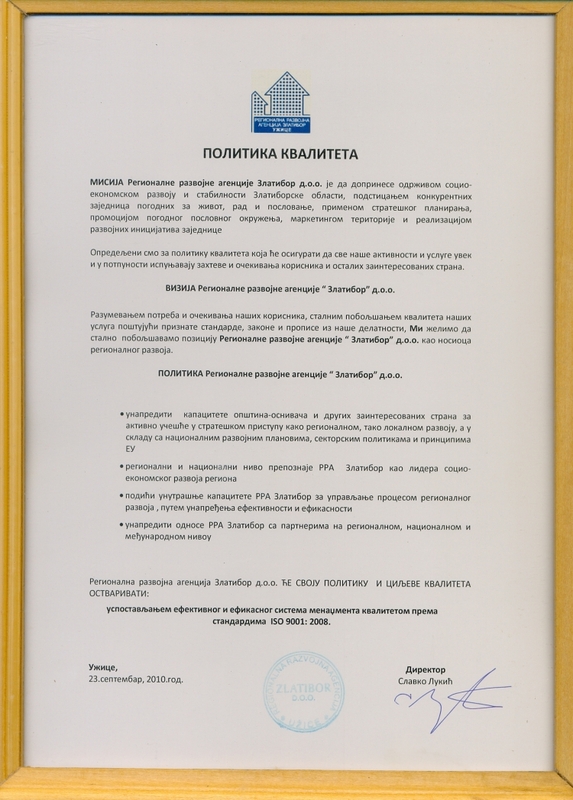 The mission of Zlatibor Agency is to foster the sustainable socio-economic growth and stability of Zlatibor Region through creating healthy communities, prosperous businesses and job opportunities by means of strategic planning, promoting adequate business environment, territory marketing and implementation of community development initiatives. The Regional Development Agency Zlatibor, promoting an adequate institutional framework and strengthening territorial cohesion, initiates and enables sustainable regional partnerships of responsible stakeholders of the socio-economic development of Zlatibor Region. It assists in defining priorities and implementing measures of regional development facilitating analyses and discussions and providing counseling to stakeholders. The Regional Development Agency Zlatibor supports the regional partnership in designing, producing, updating and implementing the Regional Development Strategy by researching, analyzing and comparing information which are relevant to its development and monitoring. Zlatibor Agency supervises and evaluates the implementation of the Regional Development Strategy, initiates its revision, prepares feasibility studies and project proposals, initiates grant schemes and prepares reports. The Regional Development Agency Zlatibor is an openness and creativity organization, which continually encourages its team members to take responsibility, recognize failure and learn from it.